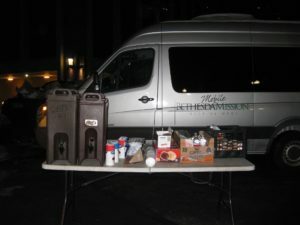 Mobile Mission is Bethesda’s street ministry that goes out every Friday and Saturday night to provide blankets, clothing, sleeping bags, hot coffee, water bottles, other supplies, and prayer to those living on the streets of Harrisburg. Jenny Greene and her husband, Wallace, have been volunteering at Bethesda for almost 20 years. 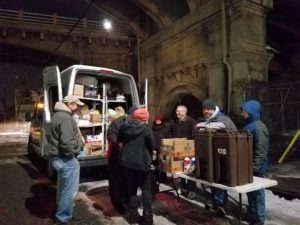 They first got involved through their church serving meals at the Men’s Mission but very soon went out on the Mobile Mission van. Sitting down for lunch with Jenny Greene is like meeting up with an old friend even if you’ve just met her. She is warm, humble, wise, and a friend of Jesus. Originally from Tennessee, Jenny and Wallace moved to Hershey when he got a job at Penn State Hershey Medical Center, where he still works as a doctor. Jenny has and still does work as a teacher in a variety of capacities. The Greenes first went out on Mobile Mission with former Bethesda staff member, Karl Beardsley. Karl retired from the Mission in 2018 and now Mobile Mission is run by volunteer teams. Jenny and Wallace go out once a month with a group that they bring from Hershey, where they live. They have a set route of 5 stops that they make in downtown Harrisburg. Jenny has a bank of stories to share from and has made many friends during all of her years volunteering. One of Jenny’s favorite stories is a time she saw God provide for a woman in a way that was specific to her needs. One night there was a teen girl volunteering with Jenny, and the girl’s mom had given Jenny some of the girl’s old clothing and shoes. Jenny remembered the things from the teen girl that she had stashed underneath a seat in the van. There was a pair of boots in those items that were the woman’s exact size. The woman hugged the teen girl and thanked her for the boots. Because the Greenes are involved in their community in many ways, they will often bring teenagers that need community service hours to volunteer with them on Mobile Mission. A lot of times the teens realize they like volunteering and choose to come back after they are finished with community service. “We see God every time we’re there — that’s why we go! He’s alive and serving through Bethesda,” Jenny said.